Girton Club-foot, apprentice to the land’s best assassin, still has much to learn about the art of taking lives. But their latest mission tasks him and his master with a far more difficult challenge: to save a life. Someone, or many someones, is trying to kill the heir to the throne, and it is up to Girton and his master to uncover the traitor and prevent the prince’s murder. Ah, Girton Club-Foot. A refreshingly different hero, in a splendid coming-of-age tale of assassins set to track down another assassin, with a dash of intrigue, magic, skulduggery and other shenanigans. I’ll warn you now, this is one of those books that I’ll pester you mercilessly about reading until you finally gave in and read it. You know the ones: Red Rising, Nevernight, Tracer or Kings of the Wyld. The awesome ones. It’s got everything. Great characters, and more to the point interesting characters doing interesting things that actually make you care about them, a tightly-crafted plot (involving the aforementioned skulduggery) and some quite gloriously gritty worldbuilding. I’ve read a lot of great books recently, but Age of Assassins shouldered its way in to stand firmly amongst them and will most definitely be on the illustrious Books of 2017 list. All the more impressive for being a debut – RJ Barker is a talented writer and I can’t wait to see what he comes up with next. I just hope that he’s writing quickly. Add this book to your list, kids. Or I’ll nag you until you do. You know it makes sense. 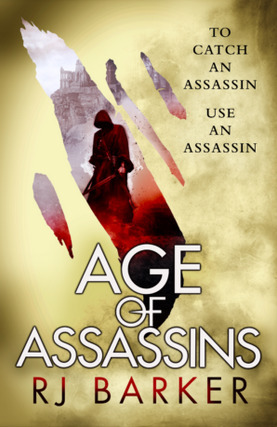 Age of Assassins is out in August and is published by Orbit. Many thanks to Nazia at Orbit Books and RJ Barker for the chance to read an early review copy. You can find RJ over on twitter @dedbutdrmng. He won’t bite. Not sorry in the slightest. not forgetting the shenanigans. Who doesn’t love shenanigans?